In past years, a few football clubs have dominated the European Champions League. Whenever the semifinal stage is reached, only clubs from the big leagues of Germany, England, Spain, and Italy are left. Not too long ago, this was not so straightforward. As a matter of fact, if we look at the current top 20 of all-time European Cup winners, we see no less than 3 clubs from the Netherlands and Belgium. While Ajax, Feyenoord, and Anderlecht were once among Europe’s best clubs, nowadays they do not stand a chance of winning the Champions League anymore. If Ajax would win the Champions League and you had bet a dollar that it would happen, you’d win 250 dollars. The likelihood of Ajax winning that cup is thus estimated to be smaller than 0.4% – and this is the highest of the 3 mentioned clubs. 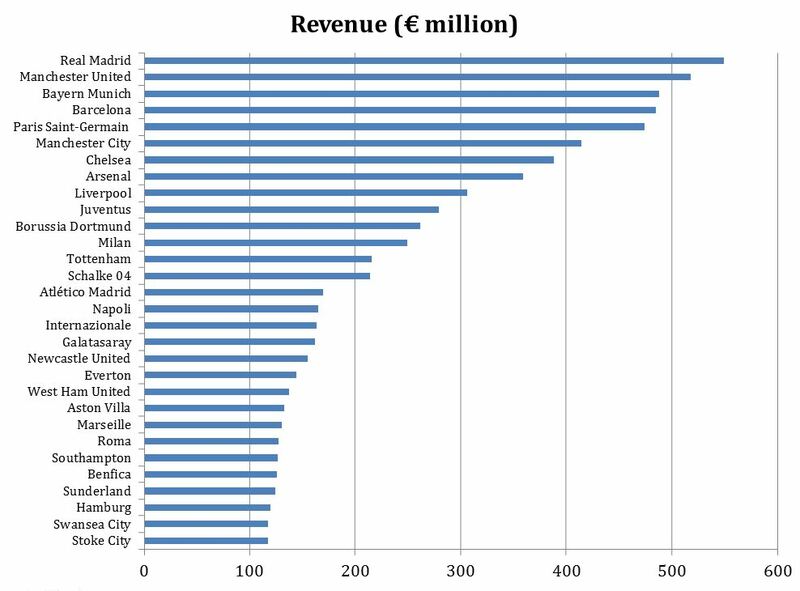 The more revenues a club earns, the more it can spend, for instance, on buying and paying better players, and the bigger the likelihood of winning a European Cup. 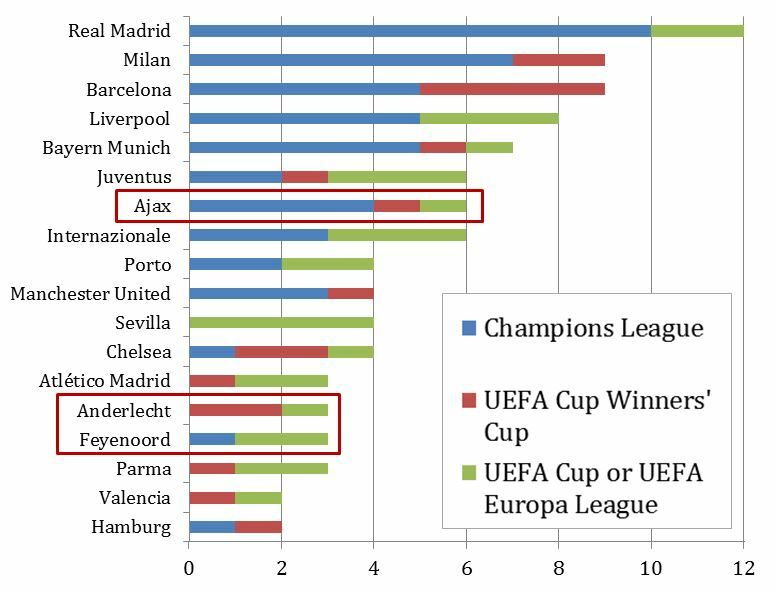 Indeed, we cannot find Ajax, Feyenoord, or Anderlecht on this graph. If we were to create this graph for 1995, however, they would be on there – where have they gone? 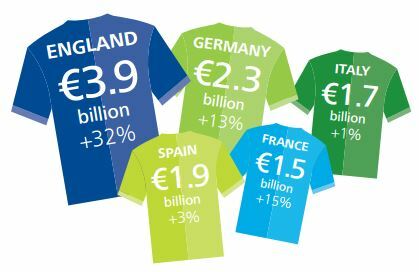 We see that the composition of revenues varies across clubs and countries. The Premier League, for instance, is know for its huge Broadcasting revenues – their broadcast revenues alone were worth €171m more than the total revenues of the member clubs of La Liga, €405m more than Serie A clubs and €606m higher than Ligue 1 clubs. The financial gap between Dutch or Belgian clubs and the top of Europe is too big for any of their clubs to be competitive. Total annual revenues for all 18 clubs in the Dutch Eredivisie equal about €450 million. Real Madrid, Manchester United, Bayern Munich, FC Barcelona, and Paris Saint‑Germain each have turnovers that are bigger than the entire Dutch league added together. If we look at the picture on the right, we see that this is not the end of the bad news. The gap is widening – revenues in big leagues are growing. 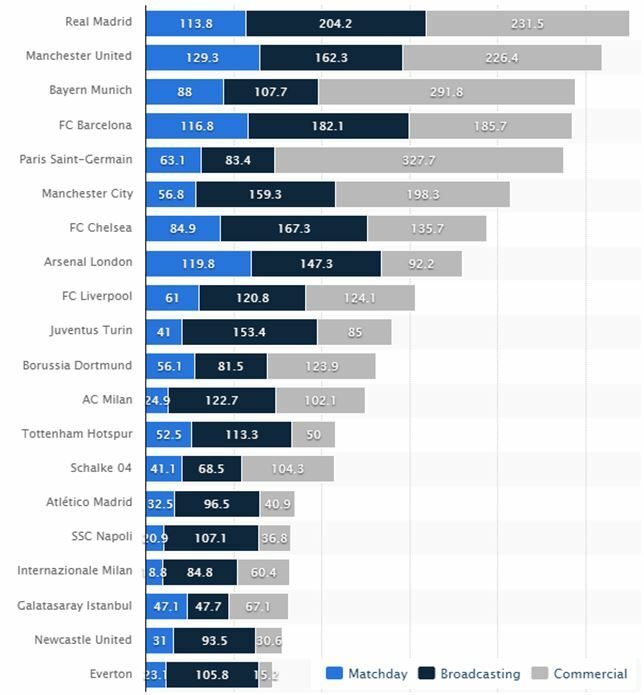 I f we look at the list of revenues per club, we also see lesser-known clubs like Stoke City and Sunderland – not exactly the Premier League hotshots. If we take Everton as an example, we can see that they earned about €106 million in Broadcasting revenues alone. This exceeds Ajax’ total revenues of €104 million. Ajax earns about €8.5 million in Broadcasting revenues – only 8% of the Everton figure. The difference does not seem to lie in Matchday revenues. Sure, tickets to Arsenal and FC Barcelona are more expensive than to Ajax, Feyenoord, and Anderlecht, but not by very much. Moreover, Ajax and Feyenoord have stadiums that seat over 50,000 people – well above the Premier League average. As a matter of fact, their stadiums would be in the top 5 biggest stadiums of the Premier League – and they do usually sell out. The international soccer fan, in the U.S. or Asia, has only limited time (and budget) to watch his or her favorite soccer matches. They will, naturally, tune in to the biggest leagues. This means that clubs from bigger leagues will have higher international Broadcasting and Commercial revenues. As the domestic population is bigger, domestic revenues are higher as well as more is spent on TV, merchandise, and match tickets. Bigger leagues means better competitors. National talent pools are bigger and revenues are higher, but leagues are still comprised of 18-20 teams. That must mean that their worst teams are better than the worst teams of smaller leagues. Consequently, as competitors are stronger, teams play against stronger competitors every week, which raises the overall level. Ultimately, all these factors together drive the attractiveness of the domestic league. The attractiveness of the domestic league, in turn, drives revenues. And revenues lead to prices. Assume that, miraculously, one of these clubs from a smaller, national league grows into a (temporary) contender for European prices, despite scale disadvantages, because of an outstanding youth academy and an extremely effective organizational set-up. Big European clubs will notice this, and simply use their immense revenues and international appeal to lure away any talent that these small clubs may have nurtured so zealously. Ajax never wanted to let these players go – they were very well aware of the qualities of these young players. They just couldn’t stop them from leaving. The players wanted to play in bigger leagues, for European Cup contenders. These respective clubs could offer the players wages Ajax could never match, in addition to paying big transfer sums. The Bosman ruling, which allowed players in the EU to move to another club at the end of a contract without a transfer fee being paid, only further increased the bargaining power of big league football clubs. Dutch, Belgian, and Scandinavian football clubs will never catch up with European top clubs as long as they play in their own, national leagues. They are simply not exciting enough, therefore lacking scale and revenues. A vicious circle continues to widen the gap. Because these national leagues are less exciting, revenues are lower and players move abroad when they reach a certain level. This further depresses the level of the leagues, further lowering the attractiveness of the leagues to both sponsors and spectators. The solution is as simple and straightforward as it is powerful. Create a new, bigger league, out of smaller national ones. Depending on which countries are interested, you could consider merging the leagues of Norway, Sweden, Finland, Denmark, the Netherlands, and Belgium. They are close enough to ensure that teams can travel easily enough for their away games. Moreover, the competition would be truly exciting. I would not know which team would be the favorite out of Ajax, Feyenoord, PSV, Club Brugge, Anderlecht, FC Kopenhagen, Rosenborg, Molde, and HJK Helsinki. By the same mechanisms these leagues currently and structurally lose out to bigger leagues, they would then regain competitiveness. Playing against better competitors every week will no doubt raise the overall level tremendously. It would create the sixth, big soccer league in Europe, and it would save Dutch, Belgian, and Scandinavian title aspirations. This entry was posted in Economics, Sports and tagged Champions League, economics, football, Premier League, soccer, sports. ← Artificial Intelligence: Dawn of a New Age of Central Planning?